EAS is 50% Heavier than WA. EA is 40% Heavier than WA. 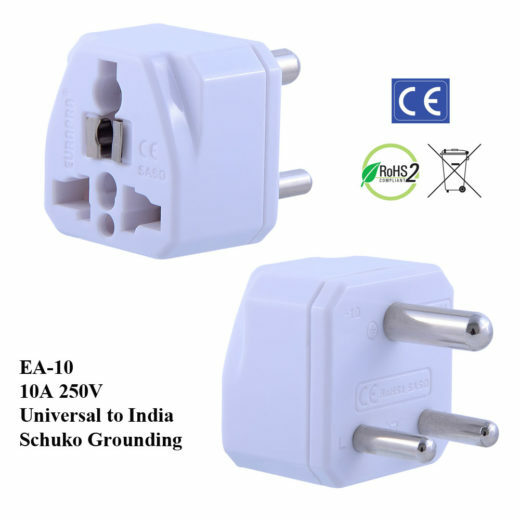 EA-10_black India 10A 250V~ 1.3 1.46 x 1.46 x 1.9 India All solid pins. No hallow pin. 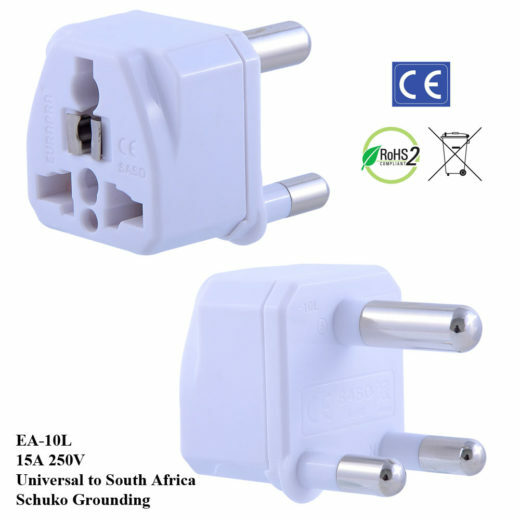 EA-10L_black S. Africa 16A 250V~ 1.7 1.46 x 1.46 x 2.2 South Africa, India for Industry Use only All solid pins, no hallow pin. EA-12_black Italy 10A 250V~ 1.0 1.46 x 1.46 x 1.7 Italy - coast cities, especially those have navel bases. EA-16_black AU/China 10A 250V~ 1.0 1.46 x 1.46 x 1.8 AU / China - use the insulated THICKER stronger metal blades, NOT the thinner China or US blades. EA-18_black Nema 6/20 15A 250V~ 1.1 1.46 x 1.46 x 1.9 US NEMA 6/15, 250V 15A US Embassies all over the world. EA-21_black Nema 6/20 20A 250V~ 1.1 1.46 x 1.46 x 1.9 US NEMA 6/20, 250V 20A US Embassies all over the world. Socket Design 1.46 x 1.46 - "L x W" Face Plate Area of EA is SAME the size of WA, but much HEAVIER. True Amperage TruAmp universal plug adapters are the only ones can truly meet IEC 60884-2-5 Amperage Rating / Temperature Rise Standards. Each Model requires its own Mold to support different end-to-end wiring. Each connection point has to be riveted. 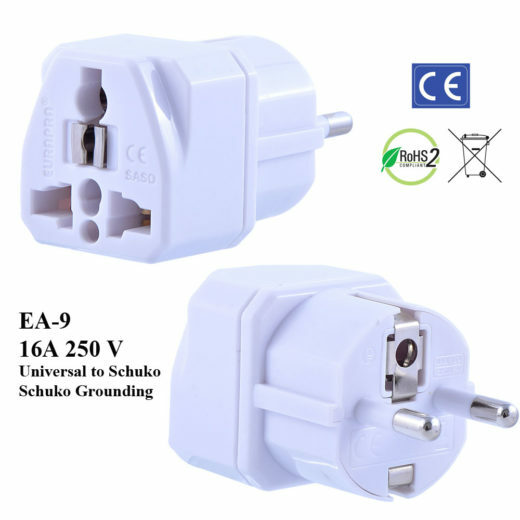 Schuko Ground More than 80% of European population use Schuko socket. 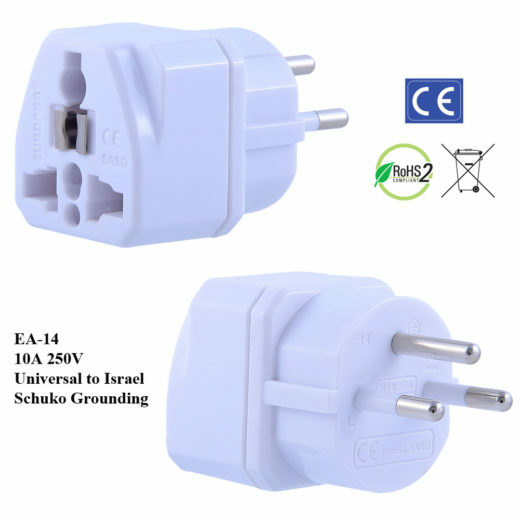 TruAmp is the only universal plug adapter that can support Schuko Grounding. Without proper grounding, static electricity in the air will mess up medical and other sensitive electronical device. 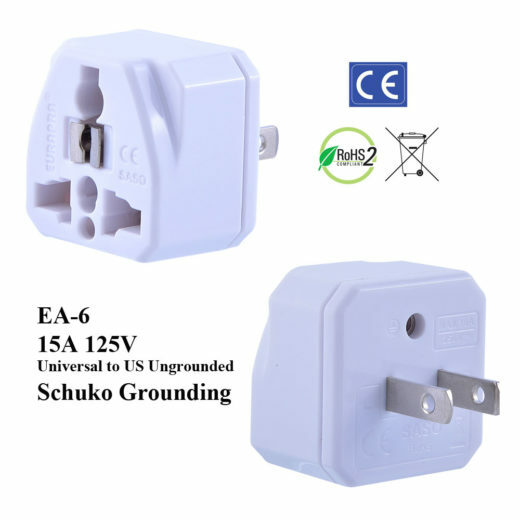 Grounding is a very important safety protection for any high Amperage devices. Main Materials Metal - Phosphorus Copper: The Highest Conductivity. Please see the IEC 60884-5-2 Amperage / Temperature Rise Test Reports. Plastic - PC V110 (Polycarbonates): Extremely Inflammable, Extremely Fire Resistant. Please see the "Burn Test" pictures and video. Manufacturing EA-9C, the EU plug adapter strictly follows the "Angled" long EU plug standard, not an Italy plug adapter without the ground pin. Supersonic Plastic Welding to SEAL all parts into ONE UNBREAKABLE adapter - You literally have to use a HAMMER to break it apart. The most of the world's 10 Amp adapters are to be tested at 14 Amp for one hour. 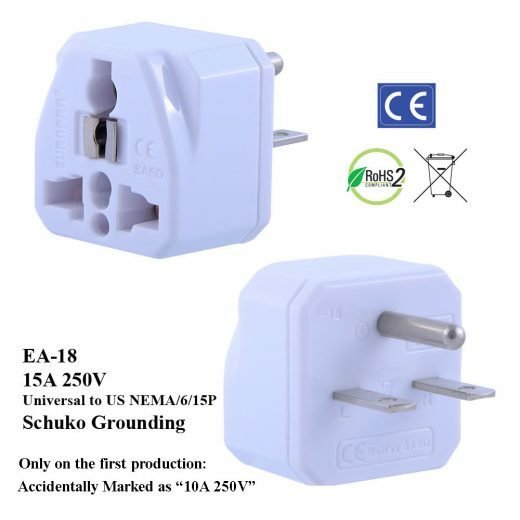 The US 15 Amp adapters (EA-5, NEMA 5/15P and EA-18 NEMA 6/15P) are to be tested at 18.75 Amp for one hour. 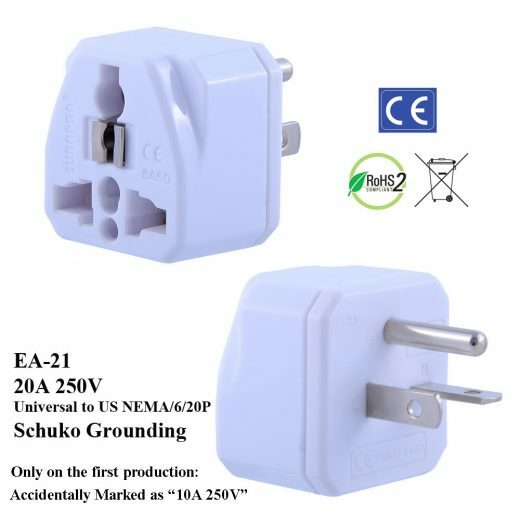 The US 20 Amp adapters (EA-21, NEMA 5/20P) is to be tested at 25 Amp for one hour. 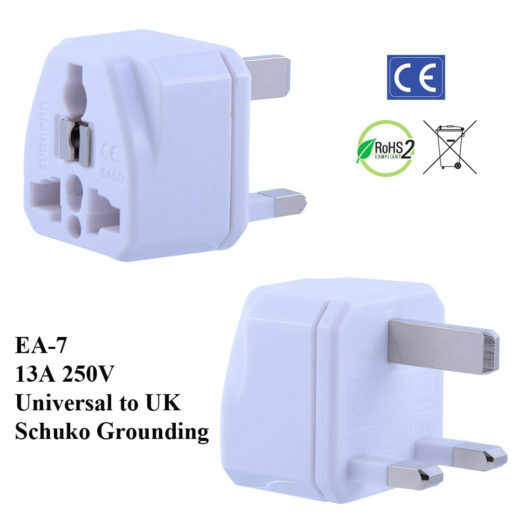 The UK 13 Amp adapters (EA-7) is to be tested at 16.25 Amp for one hour. 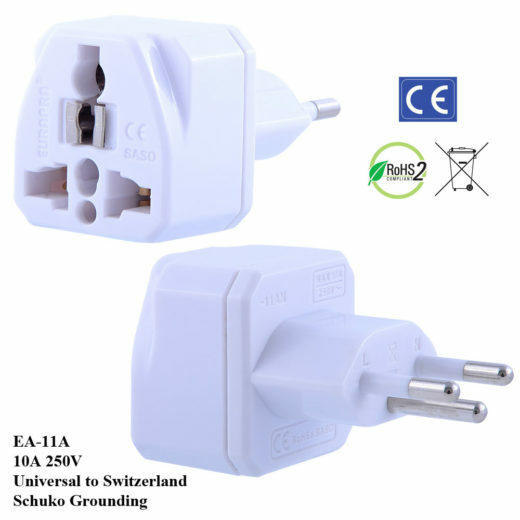 The German/French/Schuko 16 Amp adapters (EA-9) is to be tested at 20 Amp for one hour. 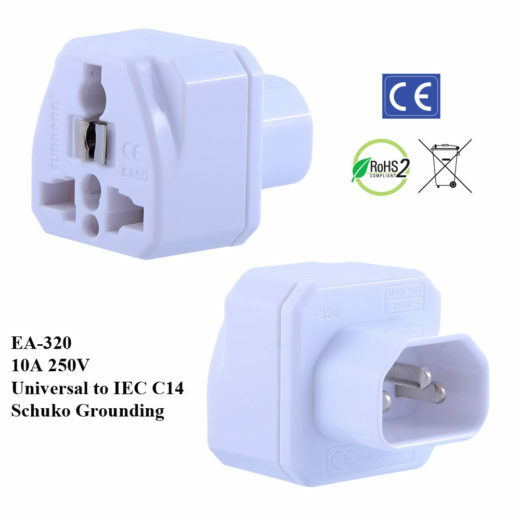 TruAmp EAS, EA use Direct Wiring, every connection is Riveted require 20+ MOLDS Wonpro WA, WAS, and ALL "Generic" WonPro 25 Years Old plug adapters All use the SAME Muli-Layered 1 COMMON MOLD CHEAP design, thus all have the same DEFECT. 2. Please note that IEC 60884-2-5 Temperature Rise is only driven by Amperage. 3. 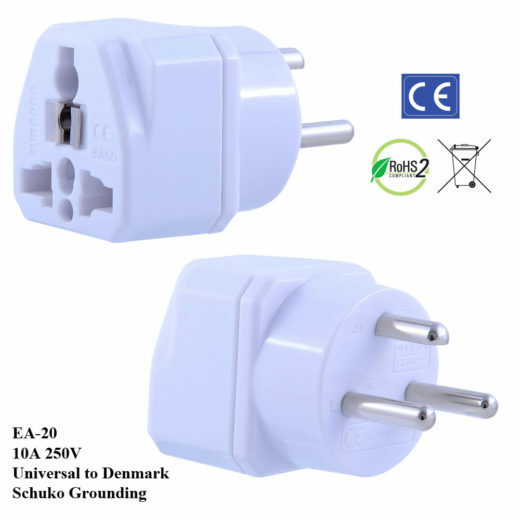 In all the Adapters, US NEMA 6/20R receptacle has the highest Amperage: 20 Amp. EAS-21 is designed to be used with US NEMA 6/20R socket. 4. Note that the most Amp you can draw out of EAS-21 is 16 Amp. 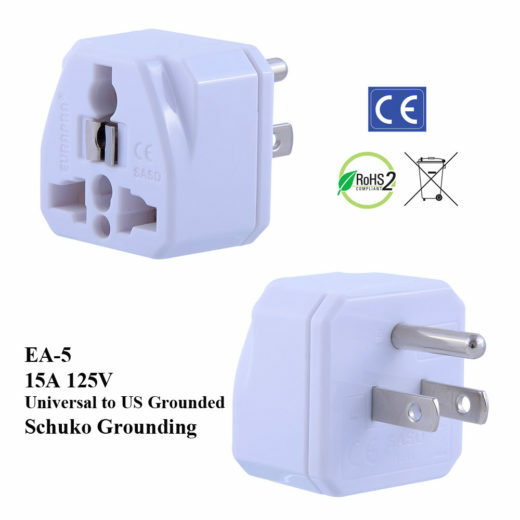 Since EAS-21 is an adapter, the plug which it can convert to use this NEMA 6/20R 20 Amp socket and draw the most amperage out of it is the 16 Amp Schuko plug. 5. In other words, we only need to test EAS-21 against 16 Amp rating (overload tested by 20 Amp electricity). In order to demonstrate our new direct wiring internal interconnectivity, we went ahead and tested EAS-21 against 20 Amp rating (overloaded tested by 25 Amp). This is an very high theoretical Amperage which will never be used in real world application. But, as shown in the table, we still pass this extremely high 20 Amp IEC rating requirement. After one hour of 25 Amp overloaded testing, its temperature only rose 43.2K (please note that temperature increased by 43.2 Kevin. 6. 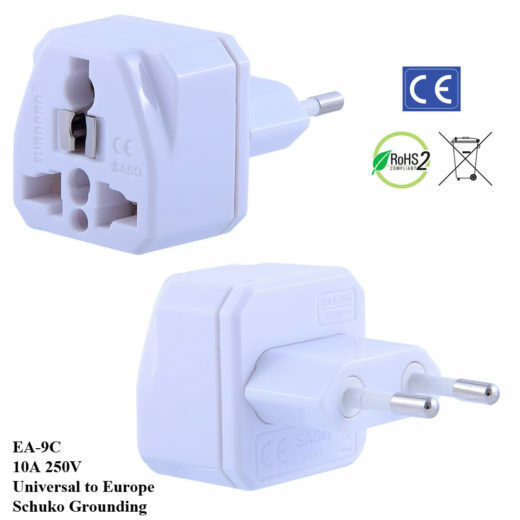 TrueAmp Universal Plug Adapter: The EA and EAS Amperage Ratings Meet IEC 60884-2-5 plug adapter standards. ALL EuraPra / "Wonpro II" adapters are Always Cool, Never Melt! 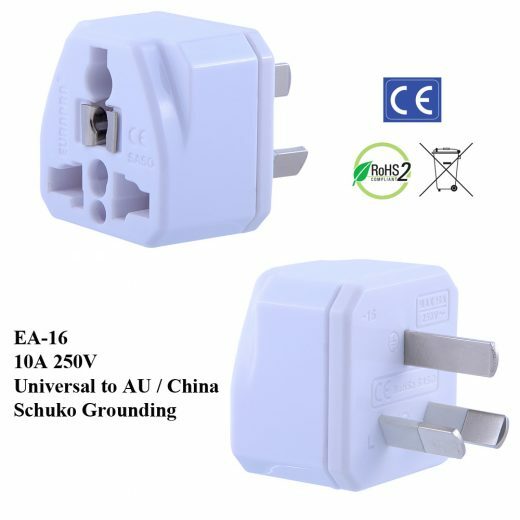 ALL WA, WAS, WASGF, WAIIvs, WAIIIvs and ALL "Generic" WonPro plug adapter are only 6.0 Amp!